See the College post at http://blogs.oregonstate.edu/science/2015/02/09/2015-teaching-advising-awards/ for a story about Henri Jansen’s advising award. 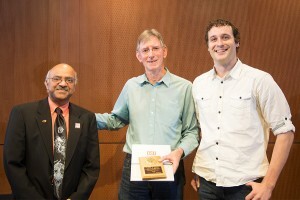 Dean Sastry Pantula, Henri Jansen and Josh Mutch who nominated Henri for the award. 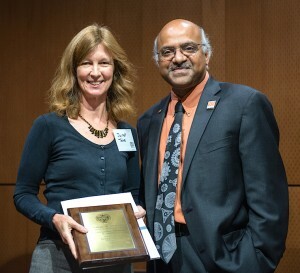 On Monday Prof. Janet Tate received the F.A. Gilfillan Memorial Award for Distinguished Scholarship in Science. Her research interests are in thin-film semiconductors for energy-related applications. Her group deposits thin films by physical vapor deposition, mostly pulsed laser deposition, and studies their structural, optical and electrical and thermal transport properties. Over the past few years her group has created new methods of doping conductors to achieve a wide range of conductivities, with applications from solar cells to transparent transistors and have demonstrated some of the highest conductivities in p-type transparent oxides and sulfide thin films. Such behavior is more difficult to achieve with positive (p-type) carriers, than with negative (n-type) carriers, and her work has been very important in developing the field of transparent electronics, a major technology based partially on basic research done by Prof. Tate and her collaborators at OSU. Posted in Awards, Faculty, Research. Physics faculty Ethan Minot and Janet Tate are part of a team of 6 investigators who have been awarded an NSF grant to acquire a $700,000 instrument for materials science research. The instrument, known as a physical properties measurement system (PPMS), will be located in the Kelly Engineering Building and will support materials research across campus, and across all of Oregon. 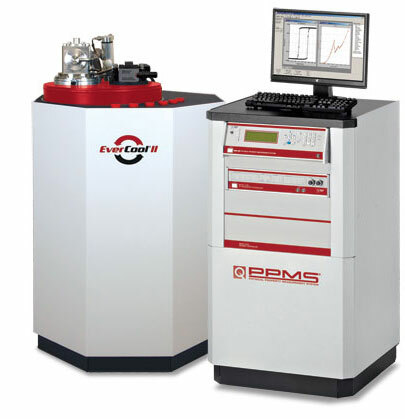 The PPMS allows researchers to study material properties (electrical/optical/magnetic) at extreme temperatures and magnetic fields.